I am so excited that I can finally share my quilt pattern and design that is included in The 2017 Quilter’s Planner today: let me introduce you to Starlight Crystals. There is so much to tell you, I don’t know where to start! First, let me thank Kitty @Night Quilter for the beautiful quilt photography. Kitty is doing amazing photography for The 2017 Quilter’s Planner this year, and I absolutely love how she captured the quilt along this rugged, rocky coast in Maine. The quilt design itself comes from a block doodle that my husband happened to glance at over my shoulder. He was pretty excited by it as it reminded him of collecting “Starlight Crystals” with his sister and family on camping trips when he was younger. It turns out “Starlight Crystals” are really known as Staurolite, and they are a really beautiful 3D shape. Once I saw the reference, it really tickled my color buttons, and I knew that the bricky reds and sienna colors were going to be fun to play with to try to recreate the 3D look in the quilt block. The full block is fun and large at 24-inches, and the selection of a light, medium, and dark tone for the Starlight Crystal block is key to having the design pop. For my quilt, I used Robert Kaufman Kona Sienna, Ruby, and Brick for the Starlight Crystal offset by Kona Snow for the background. I used 50wt Aurifil in Dark Carmine Red (2460) for the quilting, which blends in with Kona Brick and stands out more against the lighter colors. I chose to work with some variations of straight line and dot to dot quilting to continue to emphasize the overall design, and I love the texture it added to the quilt. The Art Deco vibe and texture of the quilting on the back of the quilt is an added bonus and one of my favorite aspects of the finished quilt. I also get excited when I can see the fun secondary shape that is created by the background fabric surrounding the Starlight Crystals. I am itching to re-envision the color scheme to get that negative space to truly shine. Starlight Crystals is a twin size quilt pattern and finishes at 72-inches wide by 96-inches long. The only way to get this pattern is through a purchase of The 2017 Quilter’s Planner. Last year, The Quilter’s Planner sold out in just over a month. The 2017 Quilter’s Planner pre-orders launched on Monday (July 25th), so be sure to place your pre-order now, while you still can! I am really excited to be gifting Starlight Crystals to my sister- and brother-in-law. They have recently purchased and moved into a new home, and nothing says “welcome home” like a new quilt, right? Linking up with WIP Wednesday, TGIFF, Can I Get a Whoop Whoop, and Finish it Friday. What a great location to show the beauty of your quilt! The blocks are beautiful and your quilting is perfect: intensifying the spirit of the quilt, not taking over. Wonderful job done! I love your colors, Yvonne, and the quilting complements the design very well. It’s a great gift! What an inspiration for your block and reminder of past for your husband. Love the interpretation, turned out great! And Kitty’s photography is fantastic! Very cool quilting on this new quilt…I love dot to dot quilting! Yvonne this quilt is gorgeous! The colors are so vivid against the Kona snow. Love the design and the quilting is spot on for this design! I cannot wait to get my planner…and have your pattern. The photography is fabulous! 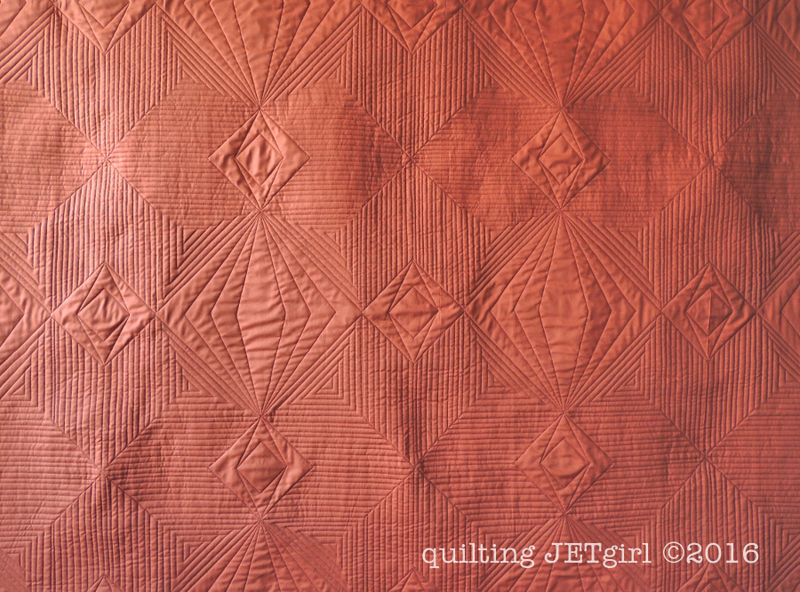 Absolutely beautiful quit, I loved the backing picture where all of the quilting detail can be seen. Starlight Crystals is really beautiful Yvonne! The quilting you did makes it even more awesome! Love the inspiration for your block. Kitty’s wonderful photos set in Maine make me want to go there. Congratulations on being in the planner! Your quilt looks like it was planned to coordinate with the cover in so many ways! Your quilt is stunning, and the photography… well, I wish I were on the coast!!! Your quilting is beautiful–I always love the graphics of your quilting. That’s a beautiful pattern and the quilting is really stunning! Your quilt is beautiful and I love the beautiful photography. I’m looking forward to receiving the new planner! I had never heard of starlight crystals before. Thanks for sharing. Gorgeous quilt!. The quilting shines through on the back beautifully. All in all a real beauty. Wow! I was feeling iffy on whether or not I should order the quilter’s planner (I had heard lots of good things) until I saw your quilt. Wowza! I have pre-ordered my copy and can’t wait to get it! Good Morning Yvonne! This is a spectacular quilt! I love the fabric colors that you chose to create the depth and special design because it really did work perfectly! You are such a dynamic designer and quilter combined. I get more inspired by you each and every time I visit your blog. Thank you so much Yvonne for sharing all that you do and for just well just being you!!! Have a fantastic creative day! I am sending loads of smiles and extra big hugs on a spectacular quilt!! That is a great quilt, Yvonne. The pattern really does look like the crystals, which are so neat that it is hard to imagine they form naturally. It is also great to see the planner project growing in strength. Absolutely love this quilt. I love the graphic design and the colours are really good – browns are a bit of a departure for you aren’t they? It’s worked! This quilt is really stunning, Yvonne. You are doing amazing work with colour choice and placement. Congratulations Yvonne. This is a lovely pattern. Great visual appeal with both positive and negative blocks. I always love to hear the story behind a quilt design. Thanks for this new inspiration. It’s a fun quilt design and absolutely lovely photography. Looking good! Pretty striking color combo and great design. Well done! How cool! I really love the backstory of the crystals so much. 😀 Super contribution to TGIFF. It is beautiful. I love the quilting and the inspiration. This is such a gorgeous pattern. I’d never seen or heard of staurolite before but you captured it perfectly. I think that is your quilting super power – you are so good at creating a quilt that has a 3 dimensional feel using solid colors fabrics and the right quilting to make the design just pop. I’m curious, with all of the straight line matchstick quilting, are you using rulers? That is such a beautiful pattern, I was just up in Maine in June on vacation. I can’t wait, I just ordered my quilters planner for next year so I will be able to create this beautiful pattern and try more machine quilting… I have been doing more hand quilting or tying of my quilts. But as I am progressing and growing, so are my quilts! I am learning new tricks as well!